For lifelong Nintendo-ites like myself, it’s often rewarding to look back at the games I played when we played as kids to see how major series concepts might have sprouted from seeds planted years back. Take, for example, the tiny planets of the Super Mario Galaxy games. And compare them to the Japanese box art for Super Mario World. 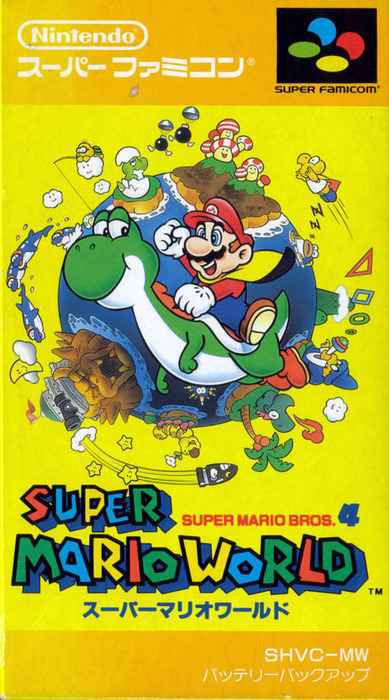 The game didn’t have little round planets, and the illustration is just showing that the title isn’t a misnomer: Super Mario World is a lot bigger in scope than the previous Mario games. It’s not Super Mario County or even Super Mario Continent, it’s a whole freaking world. And see? 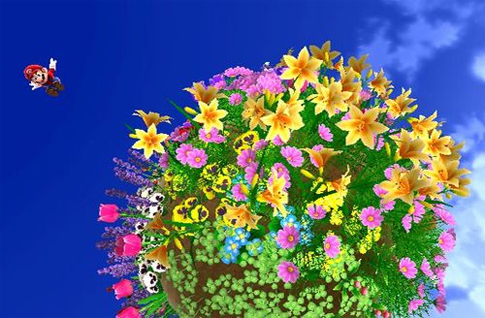 Here’s a little world to illustrate that point. Literal? Yes. But effective. And then, from a few years further along, there’s the tiny, two-dimensional planet from the Raphael the Raven fight in Super Mario World 2: Yoshi’s Island. It’s basically an in-game realization of that original illustration. You can move around the edge of the planet, avoiding the boss. Yoshi always stays at the top of the screen, and the horizon rotates behind him to give the illusion of running around the surface of the planet. I’m about to out-geek myself and quote a bit of little-remembered video game dialogue. Trust me, though, it’s appropriate. In Yoshi’s Island, before getting whisked up into space for the Raphael the Raven fight, Kamek, the cackling big bad responsible for all the game’s boss fights, says this: “I banish you to forever twinkle in the heavens.” Scarier threats have been made, sure, but given that the direction the Mario games eventually went — up, out and into deep space — the words now seem prophetic. Which one was Super Mario Bros. 5? Yeah, a lot of the stuff in Mario games come from concepts that Shigeru Miyamoto had in mind very early on but couldn't pull off until the technology caught up to his ideas. One example that comes to mind is that he Wanted Yoshi in the original Super Mario Bros. I remember getting the GBA remake of Yoshi's Island and just running around the planet making myself dizzy. I probably did it for the background music too, although I can't remember if Raphael was a fort or castle boss (if he was a fort boss I didn't listen to the music because it sucked). Speaking of which, didn't Raphael show up in Paper Mario? Glen: Yeah, I knew about Yoshi. And I've wondered for a long time why the mechanics of the NES didn't allow for a Yoshi-like creature to exist in the early Mario games. The Adventure Island games seem to pull it off just fine. Snifit: Yes, the music rocked. And yes, he's shown up a bit sense. He was in Paper Mario and he was even a selectable character in Tetris Attack.